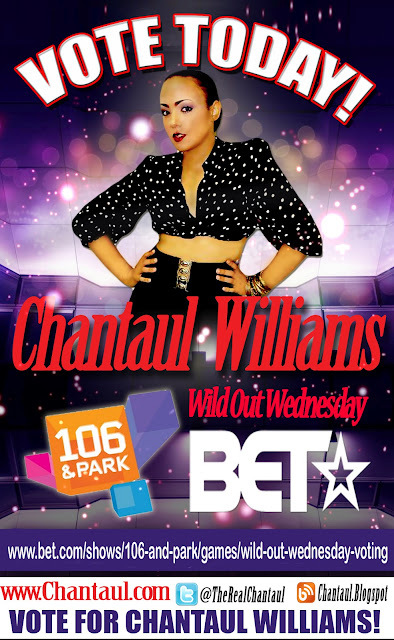 Charlotte-based singer Chantaul Williams is competing tonight on BET's 106 & Park "Wild Out Wednesday" competition. She earned her spot on the nationally televised show after beating out more than 70 contestants in the Blaze the Stage showcase when it stopped in Charlotte in May. On 106 & Park, which airs 6-8 p.m, Chantaul will compete against Gwen Bunn of Decatur, Georgia, and Sheleah Monea of Boston. You can vote for your favorite contestant by visiting www.bet.com/shows/106-and-park/games/wild-out-wednesday-voting.html. Learn more about the 20-year-old singer at chantaul.com and @TheRealChantaul on Twitter. She introduces herself in the video below and asks for your vote. The video below that one shows her performing at a Charlotte show in March, where she sings her original song "Take Me Away." It's undeniable that Chantaul has a great voice.